Global offers a wide variety of Chain Fall, Chain Hoists, Manual Chain Hoist, Hand Puller, Lever Hoists, Hand Held Pullers and Ratchet Hoists. 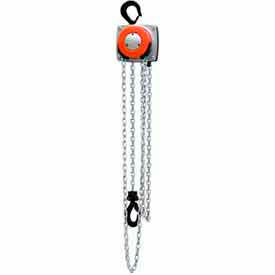 These manual hoists feature drop forge steel swivel hooks with a safety latch and a hardened steel load chain for long life. Chain hoists have tempered molybdenum steel gears and the lubrication free load brake offers positive load control. The lightweight construction of these overhead hoists is used for low ceiling applications. 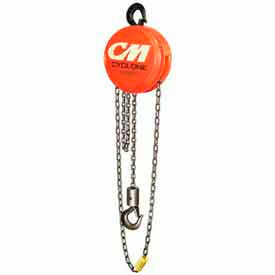 CM® Columbus McKinnon Hand Chain Hoist Provides Secure, Efficient Leverage In Confined Spaces. 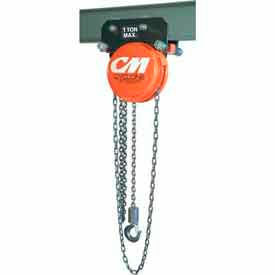 CM® Columbus McKinnon Hand Chain Hoist has lightweight steel construction for easy installation and long lasting durability. Weston-type load brake requires no lubrication. Hand wheel cover with guide slots minimizes jamming and slipping. Forged swivel hooks with latches reduce twisting of chain and unintentional unhooking of load when chain is slack. Lift capacity in pounds are 1000, 2000 and 4000 lbs. Lift heights are 10, 15, 20 and 30 feet. Metric rated. Dimensions vary per model. CM® Columbus McKinnon Cyclone Low Headroom Hoist Trolley Combos Are Used For Easy Maneuvering In Tight Places. CM® Columbus McKinnon Cyclone Low Headroom Hoist Trolley Combos have an aluminum construction for long lasting durability and dependability. The simple, efficient design features a manual chain lever and standard load limiter automatic overload protection. Reduced headroom, side clearances and end approach ensure reliable maneuverability and crowned tread and flanged wheels minimize friction. Choose from Hand Chain Hoists On Low Headroom Plain Trollies or Hand Chain Hoists On Low Headroom Geared Trollies for increased versatility. Available with capacities ranging from 1000 Lbs. to 12,000 Lbs. Lift feet, head room and dimensions vary per model. Lifetime Warranty. Made in the U.S.A.
CM® Columbus McKinnon Army Type Cyclone Hoist Trolley Combos Are Designed For A Variety Of Tough Lifting Applications. CM® Columbus McKinnon Army Type Cyclone Hoist Trolley Combos have an aluminum construction for long lasting durability and dependability. Rugged steel load bars are connected directly to the hoist frame for added strength. Used for maneuvering in tight places. Features standard load limiter automatic overload protection for added safety and universal tread trolley wheels for use on sloped or flat flanged beams. Choose from Geared Trolley or Plain Trolley models for increased versatility. Available with capacities ranging from 500 Lbs. to 24,000 Lbs. Lift feet, head room and dimensions vary per model. Lifetime Warranty. Made in the U.S.A.
CM® Columbus McKinnon Cyclone Hand Chain Hoists Are Designed For A Variety Of Tough Lifting Applications. CM® Columbus McKinnon Cyclone Hand Chain Hoists have an aluminum construction for long lasting durability and dependability. 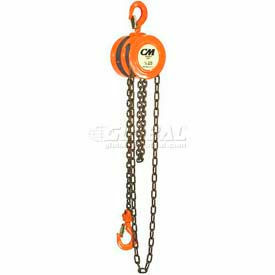 Rugged hoist alloy chain provides added strength and the fully machined, forged liftwheel pockets ensure easier lifting and smooth free chaining. An enclosed, contoured, Weston-type automatic brake allows for positive load control and the high efficiency spur gearing provides greater lift with minimum effort. Available with capacities ranging from 500 Lbs. to 20,000 Lbs. for increased versatility. Lift feet, head room and dimensions vary per model. Inspected over 75 times to meet or exceed HMI and ASME/ANSI performance and safety standards. Lifetime Warranty. 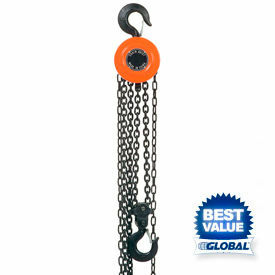 Made in the U.S.A.
CM® Columbus McKinnon Hurricane 360° Hand Chain Hoists Are Designed For Reduced Wear And Accurate Movement Of The Load Chain. CM® Columbus McKinnon Hurricane 360° Hand Chain Hoists have heat-treated steel gearing for long lasting durability and strength. Powder coated finish provides added corrosion protection. Weston style braking system ensures reliable positive load control and the chain guide and stripper assure load chain alignment. Features a standard load limiter for simple, automatic overload protection and a precision 4-pocket liftwheel for reduced wear. The manual chain lever design requires minimal maintenance and is easily disassembled, requiring no special tools. Available with capacities of 1000 Lbs., 2000 Lbs., 4000 Lbs., 6000 Lbs., 10,000 Lbs. and 20,000 Lbs. Choose from models with lift feet ratings of 10, 15, 20 or 30 for increased versatility. Head room and dimensions vary per model. Meets ASME B30.16 and European CE Standard. 5 Year Warranty (against defects in materials and workmanship). Perfect for jobs with light loads in high or difficult to reach places such as duct installation, plumbing and heating, home automobile maintenance and crane repair. Aluminum body with steel frame. 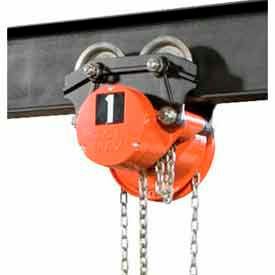 Load limiter prevents the hoist from being used to lift damaging loads beyond the rated capacity. Very low force is required to lift load. Metal chain guide allows smooth operation. Grade 100 nickel-plated load chain is corrosion and wear resistant. Strong hook latches include safety tip. Meets ASME B30.16 requirements. 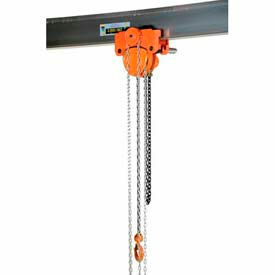 OZ Lifting Manual Chain Hoists Are Made From Lightweight Yet Robust All Steel Materials For Easy Mounting And Long Lasting Use. OZ Lifting Manual Chain Hoists feature a selector switch to raise and lower a load or put the hoist lever in neutral for quick rigging jobs. 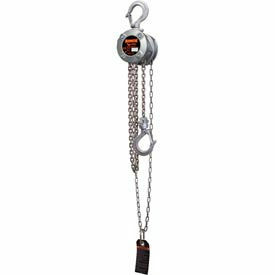 Durable rigging systems feature alloy hooks made of forged steel with bolt and lock nut connection, a stainless steel ID tag with load rating information, a shroud that acts as a chain guide, and a tag that keeps the chain clean. Chain is zinc-plated so there is no oil on the chain, which will help to keep the mechanism clean and clear of debris. 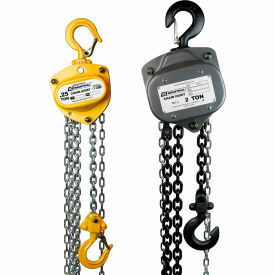 An end-stop acts as a means to pull the chain and as a lock to prevent unchaining the hoist. Optional overload protection is integral with hoist to prevent the operator from overloading and halts operation. Available load capacities range between 500 and 60,000 lbs. Chain lifts are 5, 10, and 20 feet. Chain falls are 1, 2, 4, 8, and 12 feet. Includes 1 year limited warranty. Hook opening size and headroom clearance varies per model. Vestil Low Headroom Hoist & Trolley Combo Manual 2000 Lb. Cap.